(1st Issue | August, 2017) When receiving acupuncture, do you experience instant relief? Dedicated to raising greater consciousness, robust health and vitality! Upon careful observation of the iceberg analogy shown above. A symptom (iceberg tip above the water) is a message that there is something wrong. 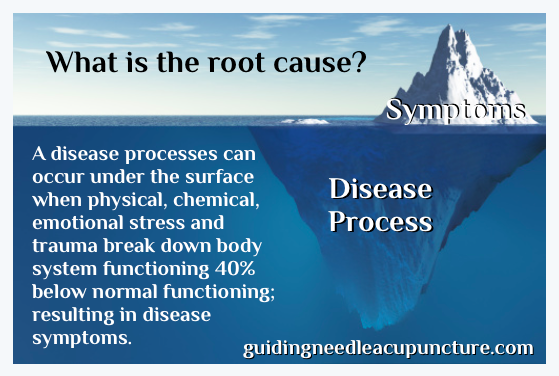 The underlying disease process (iceberg hidden under the surface) is the root cause of disease. A symptom and a disease are not the same thing. For example the symptom “infertility” can occur when a disease pattern causes a breakdown in body function, where the body is struggling to be able to conceive and carry to full term. The root cause of the health concern is the disease pattern that underlies the symptom. Common disease patterns include: external, internal, cold, heat, deficiency, and excess. A disease pattern is called external if wind, cold, summer heat, dampness, fire, a pathogen or dryness have been contracted from an external source. It can be called internal if the interior of the body system has been harmed by prolonged emotional imbalance of either; shock, joy, worry, pensiveness, sadness, grief, anxiety, fear, anger, exhaustion and greed, or food and drink. Cold is a yin syndrome that manifests as either internal cold or external cold. In most cases, cold indicates deficiency. Heat is a yang syndrome that manifests as either internal heat or external heat. In most cases, heat indicates excess. Deficiency means that the patient does not have enough Righteous Qi (zheng qi), and in most cases where the disease pattern goes from the inside out there is deficiency. Excess means that there is an overabundance of noxious Qi, and in most cases where the disease goes from outside in there is excess. Treating the symptom “infertility” without addressing and resolving the underlying root cause disease pattern can continue to degenerate the body, causing additional problems. Through pulse, tongue, palm diagnosis; the unseen disease process can be observed and comprehended. The disease process is changeable with acupuncture, cupping, nutritional, herbal, lifestyle intervention; stimulating and reinforcing the body’s own innate self healing, restoring balanced nerve supply, systemic circulation, muscle relaxation, joint mobility, organ and body function. Symptoms do not exist when optimal body functioning occurs. Eliminate unnecessary medication, tension and pain. Restore full joint mobility range of motion and overall strength. Thomas offers a comprehensive complimentary 60 minute initial acupuncture assessment for new patients in order to determine the root cause of discomfort along with wellness solutions restoring body function. Do You Experience Immediate Results After Needle Insertion? Classical Chinese acupuncture texts describe the effectiveness of an acupuncture treatment with the phrase: "Li Gan Jian Ying" which translates as: "stand the pole, and see the shadow." 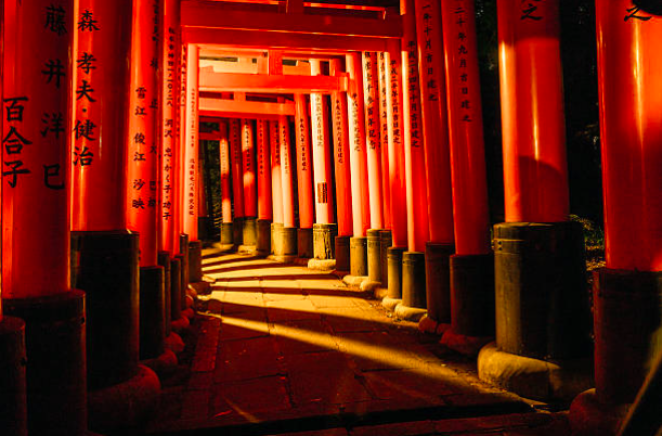 When you stand a pole under the sun, you will immediately see its shadow. Dr. Thomas Nerbas emphasizes that likewise, classical acupuncturists will see immediate results after the insertion of their correctly placed acupuncture needles. Dr. Thomas Nerbas is known in the acupuncture community as the practitioner who gets "instant results". What makes Guiding Needle Acupuncture methods unique? Dr. Thomas Nerbas specializes in distal needling techniques of acupuncture offering the added benefits of: 1. No need to disrobe. 2. Less time needed to prepare for the treatment. 3. Effective, sustainable pain relief immediately following needle insertion. 4. Acupuncture treatments typically result in 50+% pain elimination in 30 seconds after needle insertion. 5.Treatments are preventative, functional medicine (to avert the danger that’s not yet come). 6. Offering repeatable results, and joint mobility during treatments because pain is not treated at local traumatized, injured, or painful areas. All needles are placed at distal points for powerful treatments that won't aggravate pain. 7. On average, treatment clinical efficacy results in an 80-90+% pain elimination success rate. 8. Frequent treatments yield the best results and allow patients to recover much faster via stabilization care (pain does not return) which is beyond relief care (pain goes away). 9. Effective treatments are simple, quick and powerful. The Guiding Needle Acupuncture wellness process is designed to help you achieve your personal health and wellness goals. First time patients, begin by conveniently scheduling a comprehensive initial acupuncture assessment/treatment online. 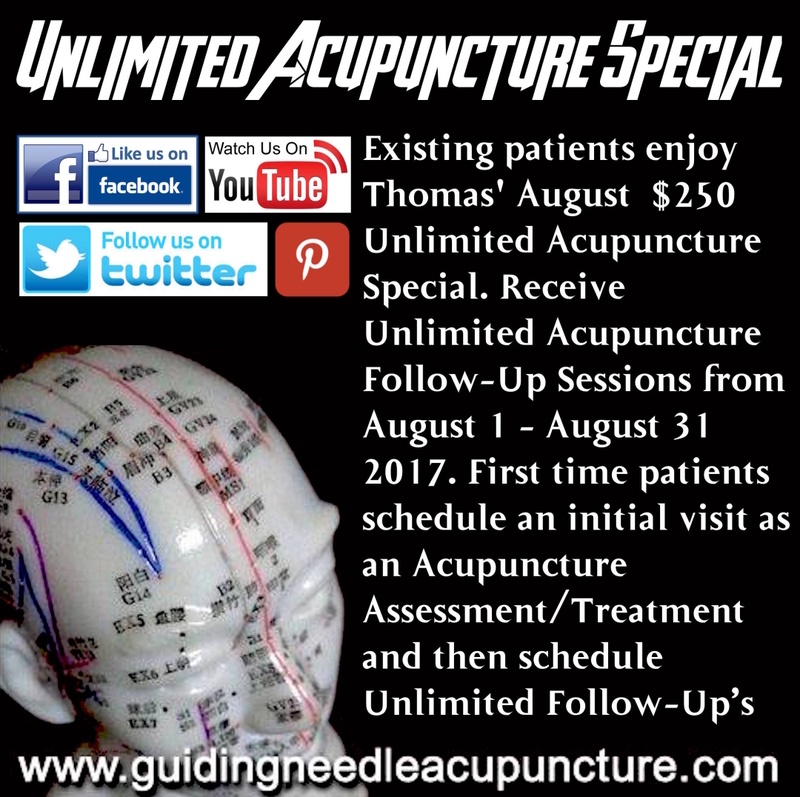 At your FREE initial 60 minute comprehensive acupuncture assessment, you meet one-on-one with Thomas to discuss your case in a no-pressure environment. This gives you the opportunity to see if Thomas' services are an ideal fit for you, and Thomas will have the opportunity to determine his ability to help your unique case. An acupuncture treatment fee of $75 applies for treatment following this free initial 60 minute acupuncture assessment.